THIS CROWD HERE TO WELCOME THE NEW CJI AND NOT FOR ME: CJI THAKUR - Pointing towards the “largest ever crowd” which had gathered at the Supreme Court lawns comprising of judges, law officers, SC officials and lawyers, all speakers said it showed how popular CJI Thakur was. 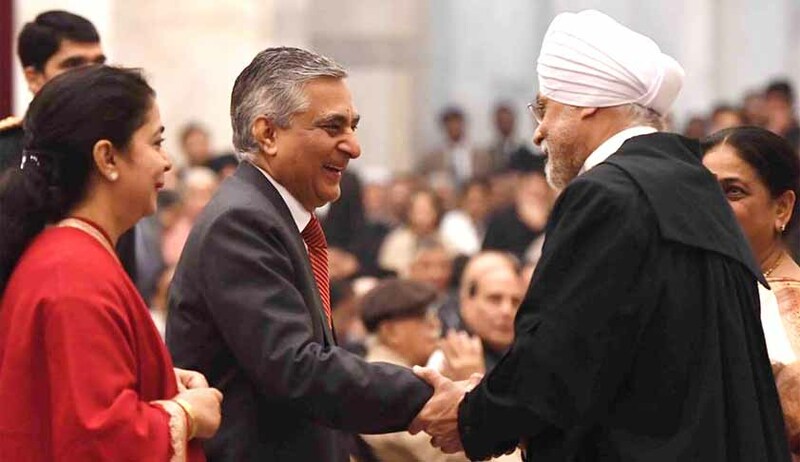 But when his turn came, Justice Thakur said the crowd had gathered to welcome the new Chief Justice J S Khehar and they only wanted to get rid of a “terrible” Chief Justice. This raised a peal of laughter and thunderous applause. CJI THAKUR BREAKS DOWN AGAIN: Chief Justice T S Thakur became emotional and spoke in a choked voice while remembering his days as lawyer. He urged for an amendment of rules to allow retired Supreme Court judges to practice law.The last time he broke down was on April 25 last year, during the state CJs and CMs conference while launching an unprecedented attack on the government for blaming the judiciary for the backlog of cases, which has hit an alarming 3.14 crore, while “doing nothing to increase the number of judges and courts despite repeated pleas from the judiciary”. Bhatia replied: “Learned AG says I’m in contempt. I plead guilty to that… But as punishment only request that I get an extra day with CJI Thakur and that is my affection for you, Justice Thakur”. AG ROHATGI ON HIS ASSOCIATION WITH CJI THAKUR: “My association with Justice Thakur, in fact with his family goes back a long way as a youngster at Bar. I have appeared before his father the illustrious judge late D D Thakur. I still remember his smiling face. He was very popular with young lawyers because he would often encourage them ..say it doesn’t matter what is the nature of a case..let us go..something or other will come up..I think Justice Thakur has imbibed those qualities of his father who was a versatile person. AG ROHATGI RATES CJI THAKUR’S ENTRY TAX VERDICT AS THE BEST: “There were several landmark judgments of Justice Thakur like the curb on use of religion and caste for canvassing votes, the BCCI one..but to my mind the biggest judgment is of the entry tax. It has cleared thousands of cases, not only in the court but in all the High Courts..there was utter confusion till then. Some High Courts had upheld it while some others had struck it down”.